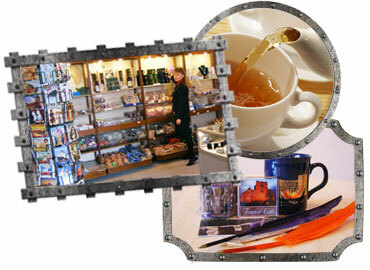 After your visit to Tamworth Castle comes to an end, don't forget to pay our Gift Shop a visit. It is a great way to finish off your visit and perhaps pick up a little something to remind you of Tamworth Castle or a gift for a loved one. Youngsters always love a quick tour of the shop to buy a small memento as a reminder of the day they stepped back through a thousand years of history! Our Gift Shop offers a wide-range of tempting souvenirs and gifts to commemorate your visit, from children's gifts, postcards, jewellery, Staffordshire Hoard replicas to historic literature from across the ages. The Castle Cafe is situated in the ground floor room of the Elizabethan wing with windows looking out onto the medieval courtyard and ancient motte. The cafe sells hot and cold drinks and confectionery, situated inside the shop; a perfect setting to enjoy a relaxing drink at the end of your visit. Following this, why not take a stroll through our fabulous Castle Grounds? Toilets - with baby changing facilities, easy access/disabled toilet facilities - are available on the ground floor level. A limited number of pushchairs can be stored on ground floor level*. *NB: These personal items are stored at your own risk the Castle accepts no responsibility for loss or damage of goods.